The Klein Tools 25 foot (7.5 m) steel fish tape is great for short wire runs under carpeting, through insulation or over suspended ceilings. 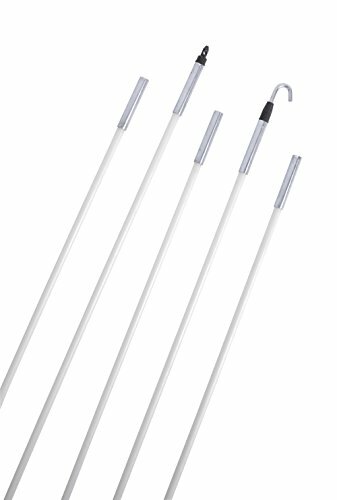 The tape features a flat, plastic slotted tip that resists snagging and easily accepts wire attachment. It also features Klein's exclusive descending laser-etched markings. 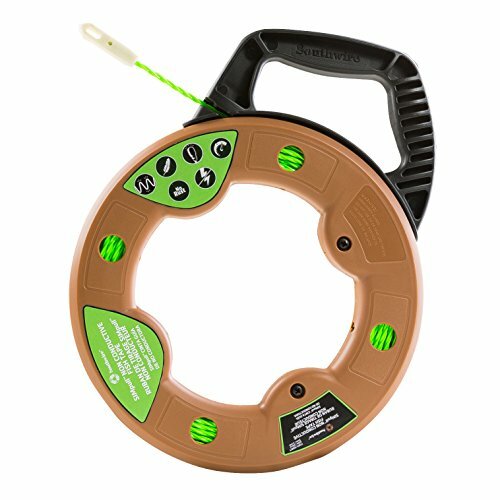 Marked at 1 foot (0.3 m) increments, this fish tape helps measure the depth of conduit runs and lets you determine the amount of tape left to pay out. Tempered, high quality tape keeps its stability as it glides between surfaces for effective pushing and pulling of wire under carpets, through insulated walls and over suspended ceilings. 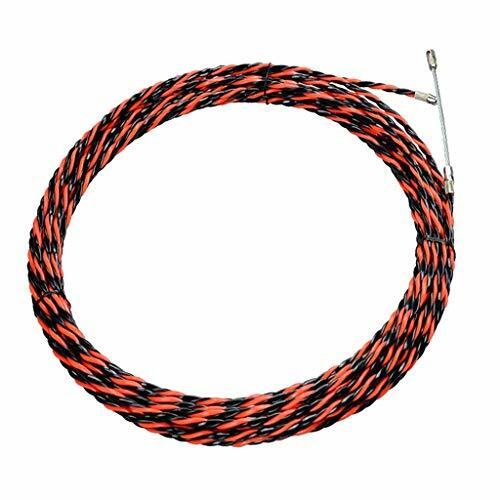 25-foot (7.62 m) length is perfect for short wire runs associated with light commercial, residential and voice-data-video-audio installations. No-snag plastic tip. High strength spring steel fish tapes are stiff for long runs and are great for heavy duty wire pulls. Laser etched markings in 1-foot (0.3 m) increments allow you to more accurately measure the depth of conduit runs and determine the amount of tape left to pay out. Polypropylene case and handle offer the maximum in impact resistance. Raised fingergrips transfer 100-percent of the winding power from your hand and fingers. Full grip style handle gives you a firm, steady grip as you pull tape from the case. Patents: D574,277. 8,212,178. 8,168,921. 8,164,025. Other patents pending. Great for running under carpeting or through insulation where penetrating strength is needed. For more than 160 years, Klein Tools has manufactured premium-quality, professional-grade hand tools that deliver the performance, durability and precision needed to get the job done right. Our family of engineers, workers and craftsman continue to put six generations of expertise into every tool we create by using only the highest quality materials, superior workmanship, and keeping manufacturing as close to home as we can. Klein isn't just the name of our company, it's also our family name. And since we're an American company that's family-owned and family-run, you know you can count on us to be here tomorrow. Klein Tools doesn't just make great products, we make great products that stand up to the demands of the professionals who use them every day ... Since 1857. 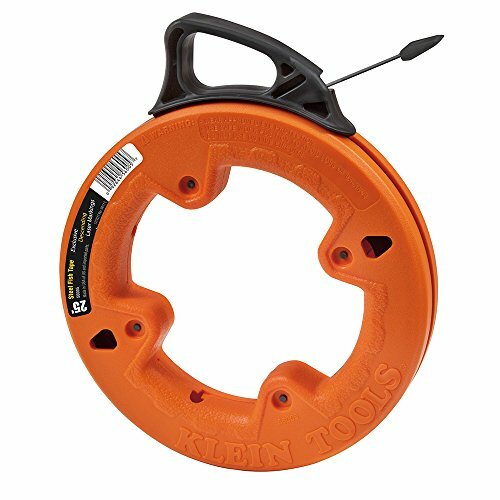 The Klein Tools 50-foot (15.24 m) Steel Fish Tape is perfect for short wire runs associated with light commercial, residential and voice-data-video-audio installations. The tape features laser-etched descending markings placed every foot. These markings allow you to accurately measure the depth of conduit runs and determine the amount of tape left to pay out. 1/8-Inch wide stiff tape features steel construction. Polypropylene case offers shock- and impact resistance. Sloped handle for quick rewinds and level payout on the backswing. Unique sloped handle optimizes hand position for quick hand-over-hand rewinds. Patents: D574,277; 8,212,178; 8,168,921; 8,164,025. Other patents pending. For more than 160 years, Klein Tools has manufactured premium-quality, professional-grade hand tools that deliver the performance, durability and precision needed to get the job done right. Our family of engineers, workers and craftsman continue to put six generations of expertise into every tool we create by using only the highest quality materials, superior workmanship, and keeping manufacturing as close to home as we can. Klein isn't just the name of our company, it's also our family name. And since we're an American company that's family-owned and family-run, you know you can count on us to be here tomorrow. Klein Tools doesn't just make great products, we make great products that stand up to the demands of the professionals who use them every day ... Since 1857. -Suitable for All kinds of situations: Outdoor, Lighting, Ceiling, Indoor, Pipe, Floor. Just connect different tools (contained on the package) for different situations. 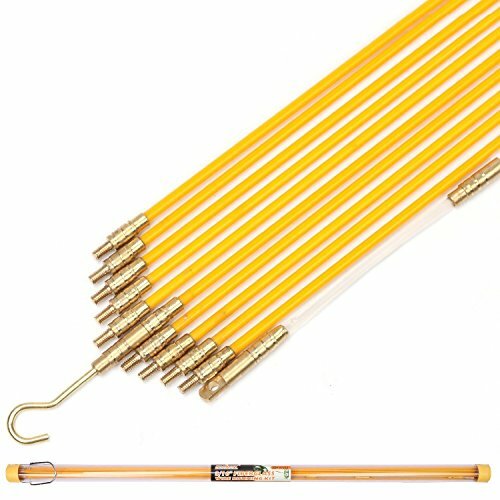 Rods connect for extension up to 33FT. Save time and keep your tie wire organized with the Klein Tools tie wire reel. 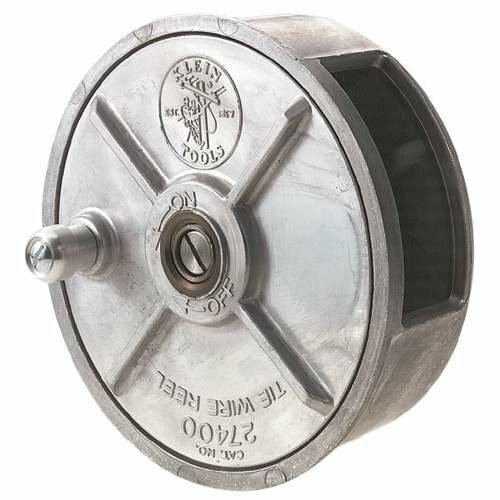 This reel is made of lightweight aluminum and can be used either left- or right-handed. For more than 160 years, Klein Tools has manufactured premium-quality, professional-grade hand tools that deliver the performance, durability and precision needed to get the job done right. Our family of engineers, workers and craftsman continue to put six generations of expertise into every tool we create by using only the highest quality materials, superior workmanship, and keeping manufacturing as close to home as we can. Klein isn't just the name of our company, it's also our family name. And since we're an American company that's family-owned and family-run, you know you can count on us to be here tomorrow. Klein Tools doesn't just make great products, we make great products that stand up to the demands of the professionals who use them every day ... Since 1857. Material Plastic-Coated Steel,Plastice Fastener with Steel rope. 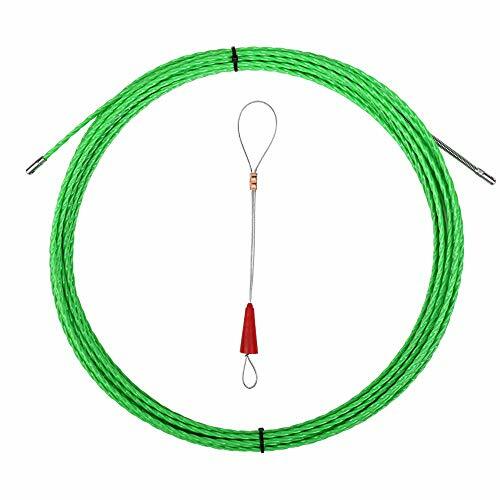 Color: 12M Green Fish Cable and Red Fastener. Size: 1200mm x 3mm/ 39ft x 10ft. Package Content: 1 x 12M Green Fish Tape + 1 x Red Fastener. How to Use? Please Pay Attention Below: First, the line pipe should be paved properly (the elbow is best bent with a pipe bender), fix the line pipe; Next, pass any end of the Fish tape through the line pipe, and pulls out a small segment of fish cable at another end; Then, connect the wires and fish tape to Fastener; Finally, one person pulls the end of the fish tape, and the other person slowly moves the wires into the pipe at another end. When pulling difficult, you need to tap the pipe gently. With bit pulling force, small friction and strong penetrating, the Plastic-Coated Fish Cable helps installers run network and power cables at home and the office. 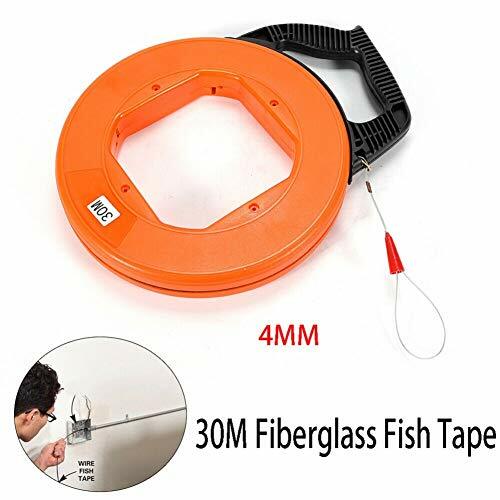 Perfect Flexibility and Rigidity Unlike fiberglass wire, it will not break if you bend too much, unlike other steel fish tape, it will not curl a lot. Our Plastic-Coated Steel Fish Tape has strong traction, good flexibility, Anti-aging and high temperature. 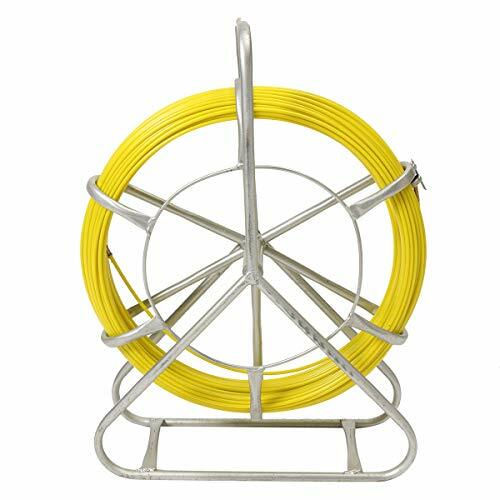 Plastic-Coated Steel With non-conductive plastic-coated construction, the versatile fish cable is applicable for telecom, electrical, wall, floor conduit and other wiring installation. It is the perfect tool to assist you in pulling cables through occupied duct and panel boxes. Fish Tape Fastener Fish tape fastener is used to help fish tape more convenient to use. One side is connected with wire, the red line cap can prevent wire disconnect when pull it. Another side is connected with fish tape, which makes the wire and fish tape connect firmly. 360 Available Head Wheel The Head wheel at the end of the cable is 360 available, much easy to across through the bends. And the unique connection method makes it durable and convenient. Attention The Fish Cable works great in smaller conduit, but not thicker cables or large pipe. The most feature filled wire pulling kit you can buy! LENGTH: Multiple sections of connectable fiberglass rods that total over eleven feet in length. 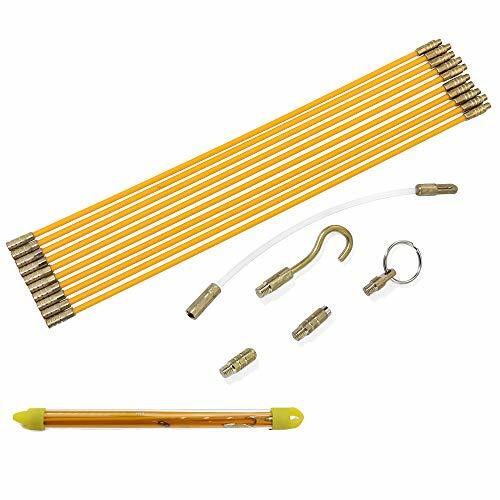 MULTIFUNCTIONAL: Tool comes with 7 different attachments for fishing wire/cable through walls. SECURE: The set comes with its own storage tube, so nothing gets lost on the job site. UNIVERSAL: Can be combined with additional kits. 100% MONEY BACK GUARANTEE - The Wire Noodler is backed by a 100% guarantee that you are fully satisfied with your product or receive your money back. 15', Steel, Mini Cable Snake Fish Tape, Compact, Use For Installing A Variety Of Wire and Cable Including Electrical Wire, Speaker Wire, and Network Cable Over Short Runs Inside Walls and Ceilings, Special Low Memory Steel Tape Does Not Curl During Extension, Easily Fishing Wire In Both Conduit and Existing Structures, Perfect Tool For Installing Wiring For Electrical Boxes, Outlets, Light Fixtures, Doorbells, Audio, Datacom and Security Systems. 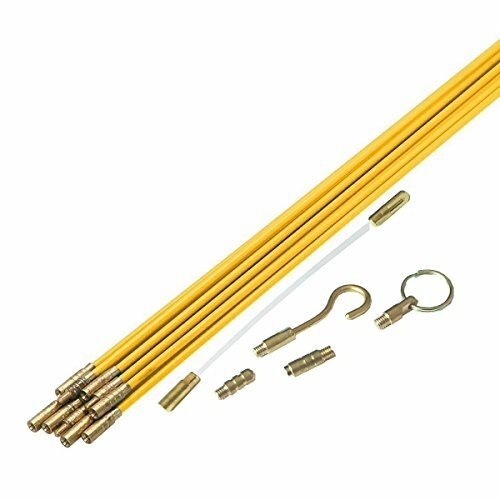 Rods connect for extension up to 11FT. EZITOWN Fiberglass Fish Tape Kit is easy for everyone to use. 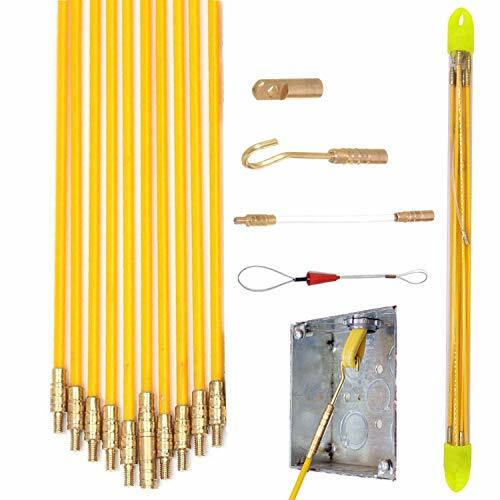 No matter if it's difficult electric wiring installation, use our sturdy fiber glass, solid brass connectors, bendable extension, just by connecting and pushing and pulling, you will get the job done. It is great for running wire through walls, attics, crawl spaces, sub-floors and suspended ceilings, etc. Klein Tools' Multi-Groove Fiberglass Fish Tapes feature a low-friction, easy feed design. The grooved profile and fiberglass core provide rigidity for long distances and less surface contact with wires when pushing through crowded conduit. It comes with a durable 7-Inch (178 mm) leader to help with navigation. Multiple grooves molded into the fish tape provides less friction in conduit with or without wires for smoother tape feeding. Durable 7-Inch spiral steel leader helps push through crowded conduit. The 13-Inch case diameter means you can reel in 15-percent more tape in a single revolution vs. a standard 12-Inch case. Raised fingergrips help transfer 100-percent of the winding power from your hand and fingers. The unique sloped handle optimizes the position of your hand for quick hand-over-hand rewinds and allows a more level payout of tape on the backswing while feeding conduit. Made in the USA. For more than 160 years, Klein Tools has manufactured premium-quality, professional-grade hand tools that deliver the performance, durability and precision needed to get the job done right. Our family of engineers, workers and craftsman continue to put six generations of expertise into every tool we create by using only the highest quality materials, superior workmanship, and keeping manufacturing as close to home as we can. Klein isn't just the name of our company, it's also our family name. And since we're an American company that's family-owned and family-run, you know you can count on us to be here tomorrow. Klein Tools doesn't just make great products, we make great products that stand up to the demands of the professionals who use them every day ... Since 1857. 1/8-Inch Wide 1/16 Inch Thick Steel 200 feet Long. Save a lot of money by doing your own wiring. Even if you've never picked up an electrical tool in your life, you can safely rough-in wiring by using the ram-pro Steel Fish Tape Reel while running cable throughout the room, and making the electrical connections. Easy-to-use installer's solution for pulling and installing cable in conduit. Reel winds up and stores excess fish tape as the wire is pulled. Strong pulling strength. Shatter proof. Finger fitting grips around reel fits the hand comfortably. Tape is wound directly into housing, no need to snap retaining tapes. Greasy lubrication covers steel to help moving properly. Exclusive hand trigger assembly helps wind tape tightly as it automatically wipes off excess lubricant. End is tapered in formed Hook so that you can attach a cord or cable and pull it back through the wall. Stiff enough for getting up a wall from the floor below. Sturdy enough to support such an application. No problem pushing it through several curvy parts of the conduits or raceway. Glides through tricky bends without sticking or snagging. 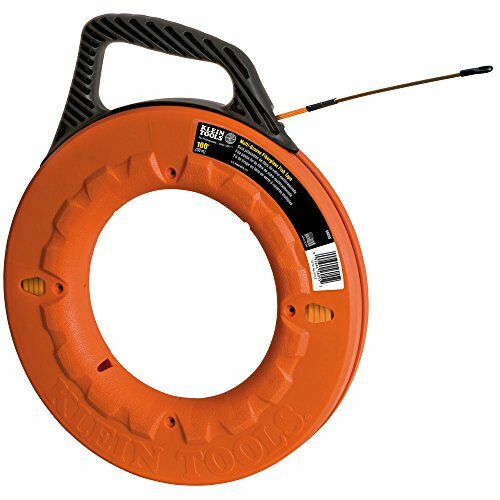 Pull wire through a tight-spaced conduit or raceway with the Ideal Turf-Grip. Trigger allows the snake to be forced without stressing the reel and always easy and smooth pull-out and rewind motion. Ram-Pro 200 feet Flat Flexible Spring-Steel Fish Tape with high impact plastic case and durable comfortable grip easy carry handle for pulling electrical or communication wires. This reel winds up and stores excess tape as wire is pulled. Handle lever Assists on rolling the cable back in. The tape is 1/8'' x 1/16'' x 200' long with a pulling loop at the end. 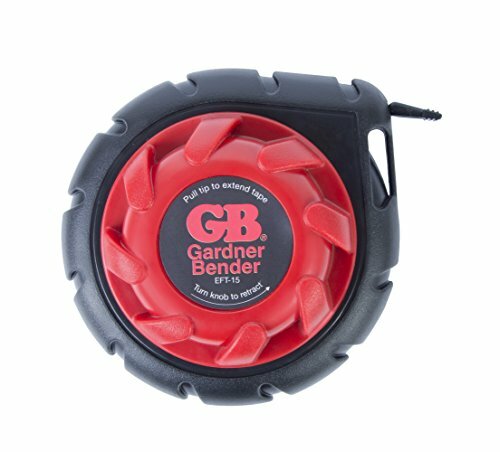 Perfect for Snaking/Thread or Pulling Cables and Wires through or Behind Ceiling, Walls/Drywall, Conduit, PVC, Pipe, Vent, Duct, Hose, Under Carpet or Insulation and more. Use for your interior and exterior Electrical Site Wiring like, Outlet, Plug, Socket, light fixture, Ceiling Fan, Dimmer, Switch, short runs installing electrical box, Electrical Panel, Subwoofer Box, Switch Box, Junction Box, CPU, Breaker Box, Receptacle box, Transformer, Doorbell, Intercom, Surveillance Camera, DCC, Security systems, Smoke detector, Thermostat, Appliances, Hot Tub, Telephone/Internet Line or Cable TV Coax. Also great for your vehicle's Wiring like for Alarm, Remote starter, Keyless entry, OnStar, Dash/Rear view Backup camera, Radar detector, Wi-Fi, Bluetooth, Entertainment system, Stereo, Horn, Audio speakers, Radio/cassette/Cd/MP3/DVD player units, USB port, GPS navigation, Fog lights, Headlights, And more for your Home, House, Car, Truck, SUV, Boat, Camper RV, ATV, UTV, Golf Car, and so. Greenlee is proud to introduce a line of laser etched steel fish tapes with SpeedFlex leaders and over molded grip handle. The new SmartMARK fish tapes increase productivity with the laser etched distance markings, SpeedFlex leader and rugged, advanced, no-bump, flared comfort grip with superior rapid pay out and rewind capability. Whether you need to fish a few feet or up to 150 feet, our SmartMARK steel fish tapes with SpeedFlex leader allow you to fish farther and know how far you have fished, in both feet and meters, improving productivity by saving time with the elimination of a separate measuring step in the installation process. The new SmartMARK steel fish tape offering complements our existing line of fish tapes consisting of a variety of materials, stiffness and length combinations to provide the best choices needed to get your fishing job done faster, safer and easier. 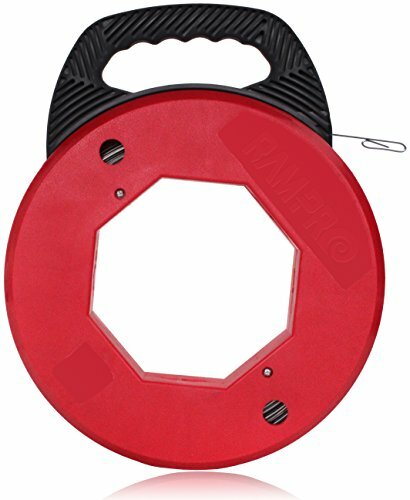 Apply to cable, wires and other wiring installation.Perfect tool to connect wire to fish tape. Easy to use, Durable in use, Great for heavy duty wire pulls. Fish tape cable is made by fiberglass material ,it is hard but please do noe bend by force. Fiberglass Fish Tape Cable Rods Apply to cable, wires and other wiring installation. Fiberglass Fish Tape Kit is great for running wire through walls, attics, crawl spaces, sub-floors and suspended ceilings, and great for installing cable. 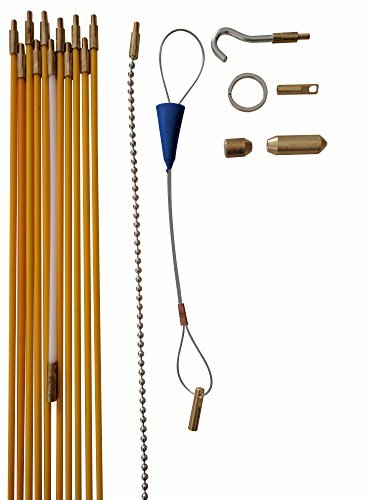 KOOTANS fiberglass wire running kit - These non-conductive fiberglass rods can be screwed together to form longer lengths for running wire through walls, attics, crawl spaces, sub floors, and suspended ceilings. 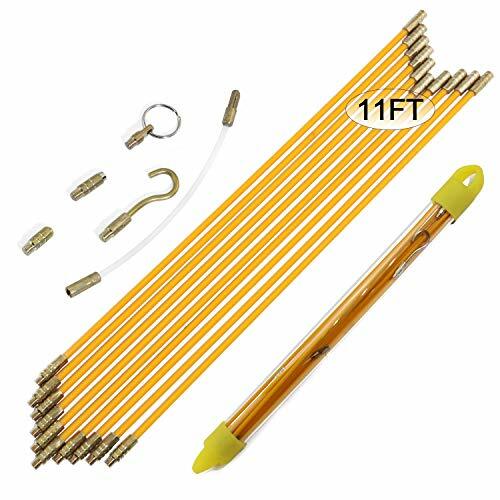 Kit includes a quantity of ten 0.33m long rods with threaded brass connectors non each end, one female and one male, also included 5 x different attachments. 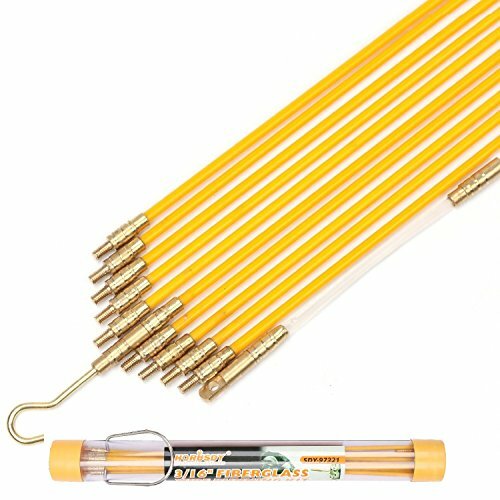 These rods are a highly visible bright yellow color. When connected they can extend up to 11 feet.A transparent plastic storage case is included with yellow plastic end caps. - Available in three sizes: 5M/ 10M/15M,brand new and high quality. - Easy to use, Interchangeable terminals and eyelets. - Flexible, tough, not deformable, can be reused. - Widely use for telecom, electrical, wall and floor conduit. - Wire body diameter: 6mm, head diameter: 8mm, wire diameter: 4mm. Available in three sizes: 5M/ 10M/15M,brand new and high quality. Easy to use, Interchangeable terminals and eyelets. Flexible, tough, not deformable, can be reused. Widely use for telecom, electrical, wall and floor conduit. Wire body diameter: 6mm, head diameter: 8mm, wire diameter: 4mm. Fiberglass Fish Tapes - This Fiberglass Fish Tape is non-conductive and fast. High strength spring steel fish tapes are stiff for long runs and are great for heavy duty wire pulls. High Impact Storage Case & one piece Nylon Handle for Maximum Durability, Long Life, and Easy, Comfortable Use. Handle gives you a firm, steady grip as you pull tape from the case. Non-conductive fish tape and eyelet tip offer added protection against shock from energized sources. Features: - 4.5mm x 70 meter duct rodder. - Hand-held bracket, easy to take, lightweight and portable. - For use in telecom, electrical, wall and floor conduit, walker duct and utility installations. 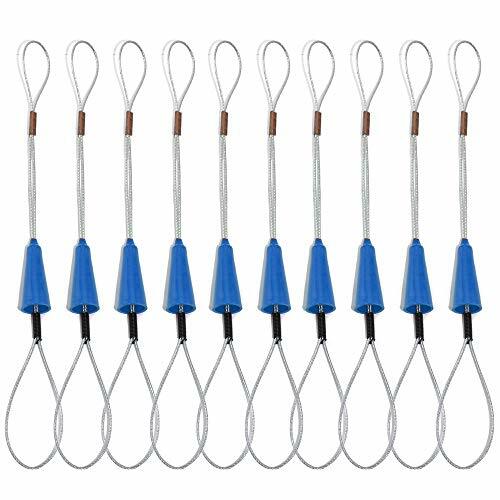 - Fiberglass non-conductive, rust and corrosion resistant, superior pulling strength. - Welded by high-quality steel, sturdy and durable, with good compression resistance capacity Specifications: Type: Fiberglass Cable Color: Yellow Material: Fiberglass+ABS Temperature Range: - 40~ +80 ( ) Line Density: 210 (g/m) Minimum Bending Radius: 330 (mm) Tensile Fracture: 4200kg Traction Fracture tension: 4.6 (T) Cable Diameter: approx.4.5mm/0.18in Cable Length: approx.70m/230ft Total Size: approx.50.6*15*37cm Package Size: approx.41*52*16.8cm (1cm=10mm=0.39inch) Package includes: 1 x FIBERGLASS WIRE CABLE How to use: 1.First of all, the glass rod is made of steel coated lead wheel leads, and then the corresponding metal joint, through the pipeline. 2. When used to clean up the head to drive the cleaning tool, you can clean up the pipeline. 3. When the cable is used, the wire or wire can be brought into the wire, and then wire or cable is used to pull the cable into the pipe. Please feel free to contact KingSo after-sales directly if you have any questions or suggestions. -Fiberglass Wire Cable is an excellent assistant tool for traction and guide line in pipeline. Smooth and flexible surface can make the perforated device easily through the narrow channel. -It consists of glass fiber reinforced layer, high pressure and low density polyethylene protective layer (smooth, strong, can resist harsh environment). -Non-conductive, anti rust and anti-corrosion, excellent tensile strength. Using high quality steel, strong and durable, with good compression resistance and capacity. -Equip with bracket and easy to carry. Sturdy and durable simple and convenient to maintain. 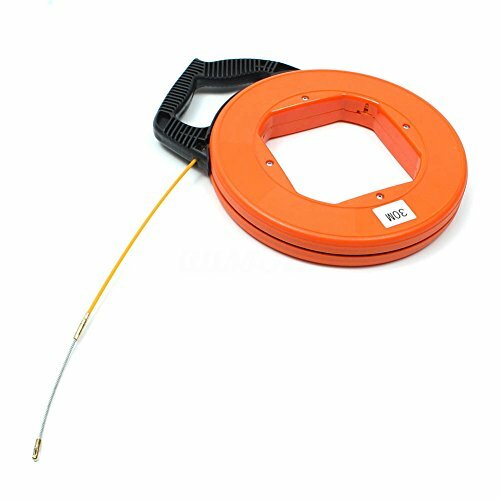 -Can be used for the cleaning and the optical cable, the cable and the plastic tube of the telecommunication pipeline. High impact storage case and one piece nylon handle for maximum durability, long life and easy, comfortable to use. Please allow 1-3cm error due to manual measurement, make sure you do not mind before you purchase.